Spring is here and that means it’s time to change our hair color! We gravitate towards the dark shades for the winter, but when the flowers begin to bloom, we are ready to as well! The standard go-to has always been lightening the hair, adding in blondes and caramel but now, we can go to the rainbow and beyond for hair color inspiration. The really daring go to the vibrant side of the spectrum, while the ones who play it safe stick to the classics, but what about the in between? Those who want to stand out but still have more of an everyday look? That is where the pretty pastel hair colors come in. You can replace deep purple for lavender hair, neon blue for a baby blue or hot pink with a pastel rosy pink. They are the perfect option this season! So, when you are spring cleaning this season, leave the dust for the pastels! 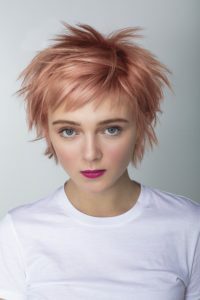 After working with your HC Stylist to gradually get to your desired pastel hair color, these gorgeous hues will require some extra maintenance. Hair Cuttery is here to provide some guidance on how to keep your pastel color lasting as long as possible. 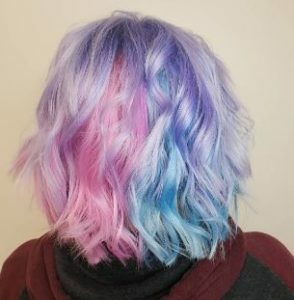 First things first, go to a pro when you are ready to go pastel. An HC Stylist will work with you after accessing your hair type and condition to make sure you achieve your dusty shade while keeping your hair healthy. Sorry, boxed-color lovers, this look is best done in the hands of an expert. We all know that color fades a bit with every wash, so the less you wash weekly, the longer your color will last. Simple math. Cutting back to once or twice a week will give the best results. This is why we are so thankful dry shampoo was created! One of our favorites is Cibu Ka Pow Dry Shampoo. It is perfect for different styles throughout the week as it absorbs oil, adds volume and extends blowouts. When it does come time to rinse your locks, be sure to turn down the water temp. Your hair will already be more prone to dryness after lifting your haircolor, but hot water will dry out your scalp and make your color fade 10 times faster. If you absolutely need a hot shower fix, you can use a shower cap on the days you skip washing your hair. However, when you need to clean your hair, it is best to use lukewarm water. Make sure you are using all the right products for your color-treated hair. You will need extra hydration and protection. The foundation is starting with the right shampoo and conditioner. We're obsessed with the NEW Matrix Total Results Keep Me Vivid Shampoo & Conditioner. This duo is made for keeping fashion hair color at it's prime. The Keep Me Vivid shampoo is sulfate-free, Gently Cleanses to maintain the vibrancy of fast-fading hair colors, prevents chlorine color oxidation, and protects against copper darkening effect due to mineral deposits. Keep Me Vivid conditioner deeply nourishes treated hair color and adds shine. Finish off with Total Results Keep Me Vivid Color Lamination Spray. It works to laminate hair color into the cuticle to prevent fading and intensify shine. We're already getting rave reviews from Guests and Stylists who swear by this system to keep your vivid color vibrant. The final step in keeping up with your pastel look is to go in for a trim and root touchup every 6 to 8 weeks. This is vital! Do you need help finding a salon? Find a Hair Cuttery near you here.